We analysed all election news found in the television programmes. For the press, we included election news found on the front page, the first two pages of the domestic news section, the first two pages of any specialist election section and the page containing and facing the papers’ leader editorials. Our methodology can be found here. In this report we focus on the following features of news coverage during the opening stage of the formal campaign: 1, the visibility or presence of the different political parties and other organizations and individuals in the news; 2, the most frequently reported political figure; 3, the positivity and negativity of press reporting of the main parties; and 4, which issues attracted most media attention. Intercoder reliability tests were conducted on all key variables1. The sample dates for Week 1 were 5th, 8th and 9th May 2017, inclusive. The sample dates for Week 2 were 10th, 11th,14th,15th,16th and 17th, inclusive. The second week of the formal campaign saw a shift in the relative prominence of the two main parties in media coverage. In week 1, the Conservatives gained slightly more TV exposure and considerably more press coverage. By the end of week 2, Labour had accumulated a 7 percent advantage in TV appearances and gained parity in press coverage. This marked shift is probably explained by the leaking and then formal launch of the Labour manifesto in the second week of sampling. Overall, the Conservatives and Labour have commanded 71 percent of the appearances on TV and 85 percent in the press in coverage so far. 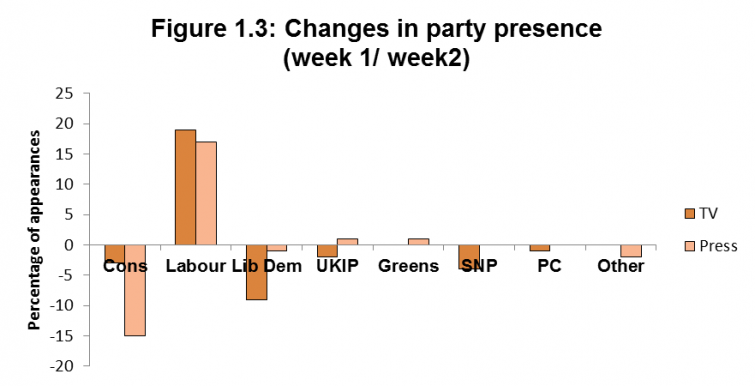 The ‘two party squeeze’ in press and TV coverage tightened in week 2. This dominance of the two main parties far exceeds their position at the same stage of the 2015 General Election. The Liberal Democrats, SNP, UKIP and the Greens have received consistently lower levels of coverage in the 2017 media campaign so far. A further measure of Labour’s centrality to the news agenda in week 2 is Jeremy Corbyn’s appearance at the top of the list of most frequently reported political figures. Several other Labour representatives also climbed up the chart. Our measures of the direction of press reporting of Labour show that a considerable majority of this coverage has been critical of the party and its manifesto. The greatest proportion of this negativity occurred in the national newspapers with the largest circulations. Aggregate levels of positive and negative press coverage of the Conservative party have nearly cancelled each other out. Our breakdown of the levels of coverage in individual newspapers reveals nuances in their partisanship. The Sun and The Express have particularly emphasised attacking Labour. The Mail has been similarly hostile to Labour but has had more positive emphasis in their reporting of the Conservatives. The surplus of positive coverage in The Times for the Conservative party, exceeds the amount of negativity to Labour. As a general trend, newspapers have focused more coverage on attacking the parties they disapprove of, than reporting positive issues connected to the parties they support. Brexit has received lower levels of coverage in this second week. The issue agendas of the press and TV remain very similar. The issues upon which the Conservative party would prefer to campaign remain at the foreground of media debate. The Labour party were more successful in getting their strong policy areas on social welfare and health onto the news agenda. 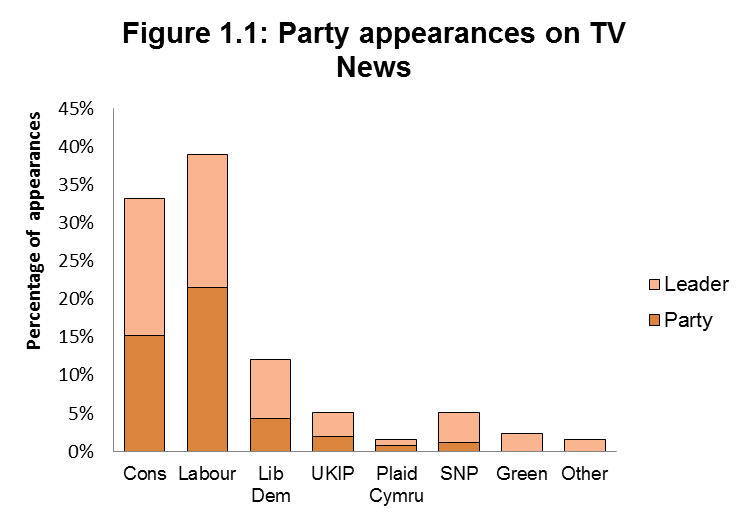 Figure 1.1 compares the frequency with which the main political parties appeared in TV news. Figure 1.2 provides an equivalent comparison for newspaper coverage. 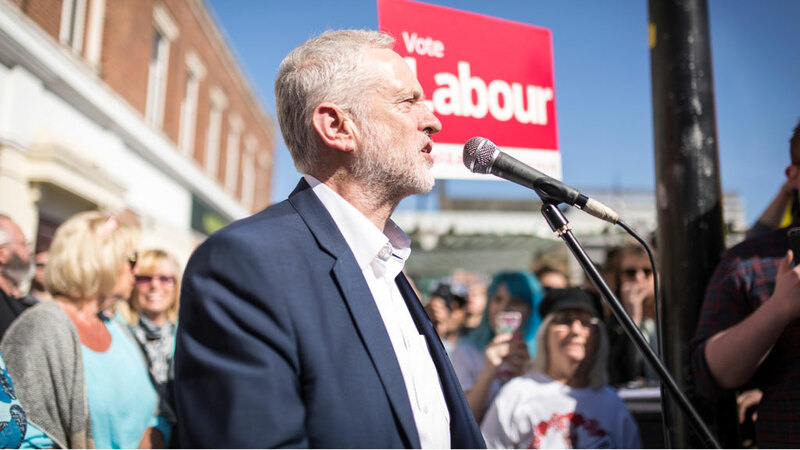 Labour has attracted considerably higher levels of coverage in both press and TV in the second week, reversing the greater levels of coverage for the Conservatives noted in week 1 of the media campaign. All other parties, apart from UKIP in the press, saw their share of coverage reduce in the second week. The dominance of the two main parties in media coverage noted in the first week has been sustained into the second sample period. The ‘two party squeeze’ is far more evident than in the previous campaign. The Conservatives and Labour have commanded 71 percent of the appearances on TV and 85 percent in the press so far. At the same stage in 2015, they accounted for 57 percent of appearances on TV news and 72 percent in the press. Table 2.1 identifies the most frequently reported political figures in the second week of coverage. It also compares their position in the previous week’s sample. Jeremy Corbyn, Labour Leader, was the most prominently featured in the second week, appearing as an active contributor to over one-in-four of all items. The launch of the Labour Party manifesto is reflected in 8 members of the shadow cabinet (including Corbyn) making the top 20. Coverage of the Conservatives has switched focus to other cabinet members this week, with Michael Fallon (Defence), Philip Hammond (Chancellor) and Boris Johnson (Foreign and Commonwealth) among the most prominent political actors. The Lib Dem, SNP and UKIP leaders have maintained their relative prominence in week 1, and have been joined by the leader of Plaid Cymru, Leanne Wood, in the top 20. The two most recent ex-PMs both make the top 20. European Union representatives such as Donald Tusk and Jean-Claude Juncker, who placed 6th and 12th respectively in the first week of coverage, fell out of the top twenty. The scores in figures 3.1 – 3.3 are calculated by subtracting the total number of negative stories from the total of positive stories. 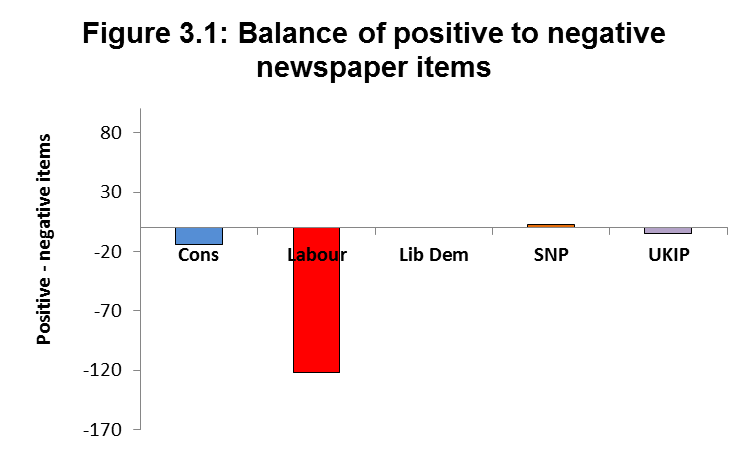 The unweighted figures show that, apart from the SNP, all parties received more negative press coverage than positive. For the Conservatives there was only a small difference between levels of positive and negative coverage across all newspapers. 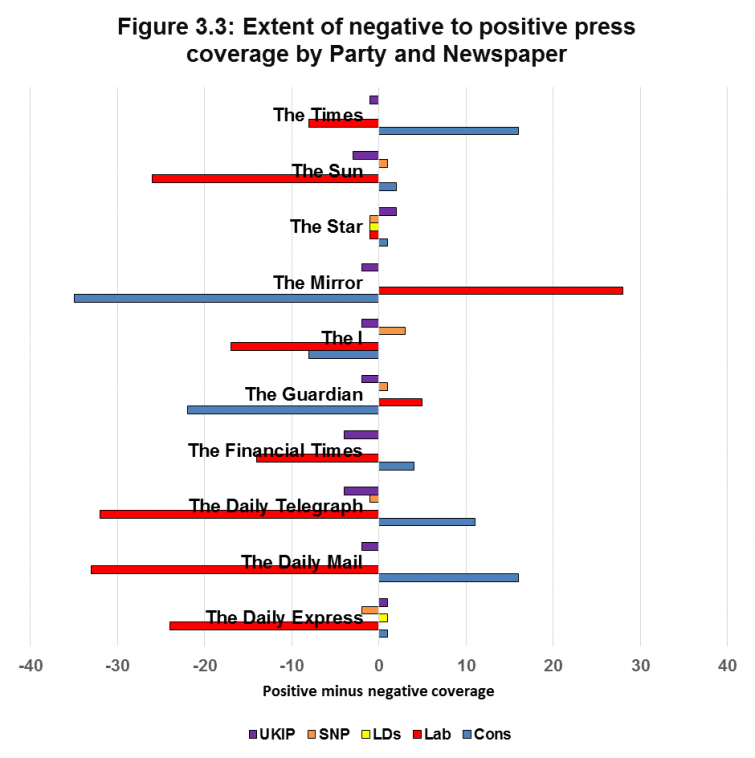 For the Labour party, in contrast, negative press coverage far exceeded positive coverage. The small variations in coverage of the Lib Dems, SNP and UKIP are to a large extent a measure of their marginal presence discussed earlier. When the different circulations of the national newspapers are taken into account, Conservative coverage moves into a positive position. This exacerbates the difference between the coverage of the two parties according to this measure. 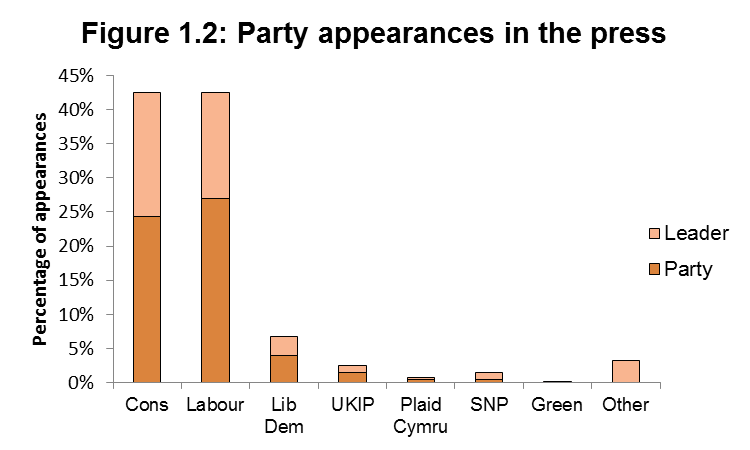 Figure 3.3 breaks down the overall distribution in figure 3.1, by party and newspaper title. The Sun and The Express have particularly emphasised attacking Labour. Their positive coverage of the Conservatives is lower than for other traditionally Conservative supporting newspapers. 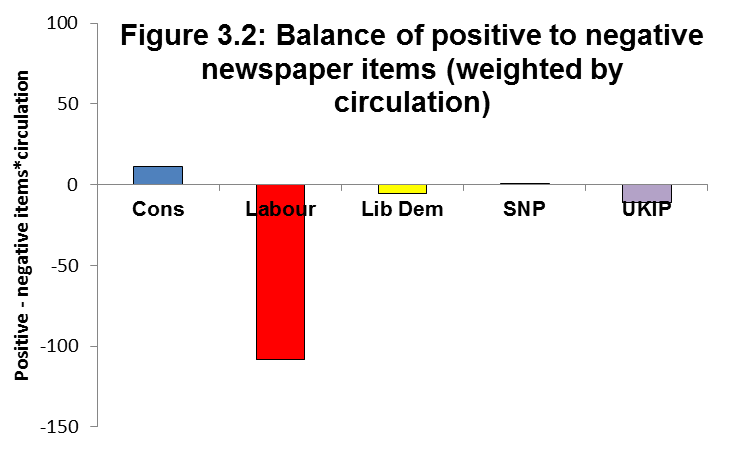 The Mail has been similarly hostile to Labour but has been more positive in its reporting of the Conservatives. The surplus of positive coverage in The Times for the Conservative party, exceeds the amount of negativity to Labour. The Financial Times, which has variably supported Labour in previous elections, shows higher levels of negative reporting of the party than other quality newspapers. Table 4.1 compares the prominence of the issues in the media between the two weeks of the formal campaign. Although down from the previous week, the main focus of TV news and press coverage remained the electoral process and what the final ballot might mean for the prospects of each of the parties. In terms of the main substantive issue, attention switched away from Brexit, down from 16% to around 8%, and immigration, now number ten, to a range of other issues, including: taxation, the economy, business, trade. All good news for the Conservatives as opinion polls suggest they lead on the stewardship of the economy. The biggest growth area was taxation. The main focus here was on Labour’s plans for a higher tax rate for top-earners. Conversely, health and, issues on which the Labour Party wish to campaign, were less prominent. The issue of devolution dropped out of the top 10 suggesting that the Scottish (or indeed the Irish) is becoming less significant as the campaign unfolds. Although both press and TV news gave coverage to the same top five issues, there was some divergence especially in attention given to social security, public services, defence and employment. The press focused more on social security and defence and the TV news, on the latest employment figures, public services, and gave less coverage to social security matters.